Being healthy is not only good for the individual, it’s good for business. Healthy people don’t miss work and are more productive when they are at work. 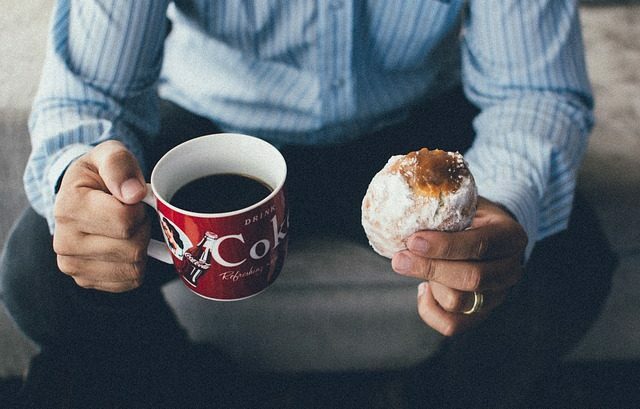 So, let me share seven important unhealthy habits at work based on material from my book, Healing Begins in the Kitchen. Sitting still for hours can compromise your immune system. Your body needs movement in order to stay healthy. Getting up and walking, or even using a stand-up desk, keeps your lymphatic system flowing and your oxygen levels higher, so take stretch breaks or march in place at your desk every half hour. Studies have shown that people who do this consistently retain more of what they are learning and have better recall. Don’t drink coffee or black tea all day long. One cup of coffee or black tea in the morning isn’t a bad thing, but you need to drink water throughout the day in order to maintain optimal health. Herbal teas are okay to have frequently, but too much coffee or black tea will raise your body’s acid level and can lead to calcium depletion of your bones as your body tries to regulate the blood pH. Avoid taking work home with you on a regular basis. Maybe you want to impress the boss, but you’ll be more productive at work and will avoid burnout if you take quality time off every day. The concept of “be here now” is so important to your health. Taking work home with you robs you of your personal time and adds to your immune-suppressing burden of stress. Skipping lunch can be hazardous to your health. Sometimes it is tempting to press into a project and miss out on lunch, but you need to fuel your body and brain with nutritious food to be your best at work. Running on empty leads to low blood sugar which can restrict your ability to think quickly and clearly, and also slows you down. If you don’t have time for a lunch break, at least have some almonds or a healthy meal-replacement bar handy so you can refuel. Watch your bad attitude. It’s common to hear employees bellyaching and complaining about various things, but keep your attitude positive and have a solutions focus. You’ll find you have a stronger immune system. Positive attitudes lead to healing hormones like serotonin and oxytocin being released which support healthy immune function. Negative attitudes lead to damaging hormones being released (such as adrenaline and cortisol) which suppress healthy immune function. Attitudes are contagious, so surround yourself at work with happy, positive coworkers. Besides, it doesn’t do any good to complain to others. Half the people you tell don’t care, and the other half are glad you’re worse off than they are! Stop letting deadlines stress you out. OK, this one’s a little woo-woo. Stick with me though. Change your approach to those deadlines by scheduling frequent micro-breaks for focused breathing. Take five deep breaths every 30 minutes to an hour to help keep your immune system strong in order to protect your health. Studies have shown that when your brain is oxygenated, you perform better as well. I know, it sounds crazy – but it’s the truth. Resist starting your day with donuts. Give your body something better than a high-carb, sugary breakfast to start your day strong. Try having a quick skillet scramble with pastured eggs cooked with high-antioxidant vegetables. Then you will be happily and healthily full and able to say no to those sugary treats at the office. If you’re not able to cook a hot breakfast, blend up a vegan protein drink. Here’s a quote you might find interesting: Let food be your medicine and medicine be your food. These are not words of some twenty-first-century alternative health-care guru, no. They are the words of Hippocrates, the father of Western Medicine (b. circa 460 BC). We should take that to heart. Literally. Being healthy is smart for you and smart for business. I know. I learned this the hard way. If you’d like more information on how I learned this, check out my book, Healing Begins in the Kitchen. Here we are, celebrating another Thanksgiving day in America. Beth and I have a lot to be thankful for this year, not the least of which is our good health. Just to bring you up to speed, we both received the “all clear” this year after learning about a threat to each of our health. Me with prostate cancer that seemingly came out of remission. Beth with a breast cancer diagnosis. 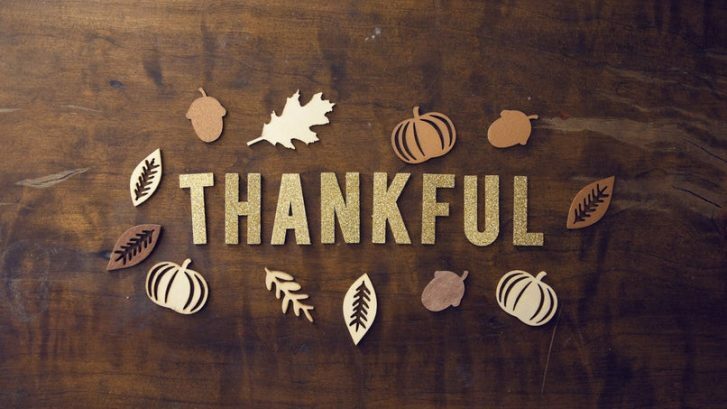 As you might imagine, good health is one thing we are extremely thankful for today. We want to share what we have done to move from having cancer to having complete health with you. Because so many of you have expressed interest in having the same kinds of powerful results, we have created a joint-venture with Majors Enterprises to bring you a 90-Day Misner Plan Challenge at the start of the New Year. As our Thanksgiving gift to you, here is a link that will take you to a recipe for my personal favorite Thanksgiving dish: Misner Plan Corn Casserole. Please add this recipe to your table tomorrow as part of your Thanksgiving feast. Enjoy, and have a wonderful Thanksgiving. I get request after request to share my foods list and eating protocol—so many that Beth and I have created the Misner Plan in order to share this information with many more people than we are able to email on a daily basis. We all know and love far too many people who are obese and/or suffering from many health issues which are due primarily to how and what they are eating. Many people know they need to make changes, but they are not interested in doing so. Many people want to make changes, but they don’t know exactly what to do. There is a lot of conflicting advice out there and there may not be a lot of support for the changes they do want to make. In this recording, I share my personal journey into health. At the end, you will learn how you can get the material, the coaching, and the support that will help you move into health with our 2018 Misner Plan Challange. Are you as healthy as you want to be? Do you have any health challenges or are feeling stressed? 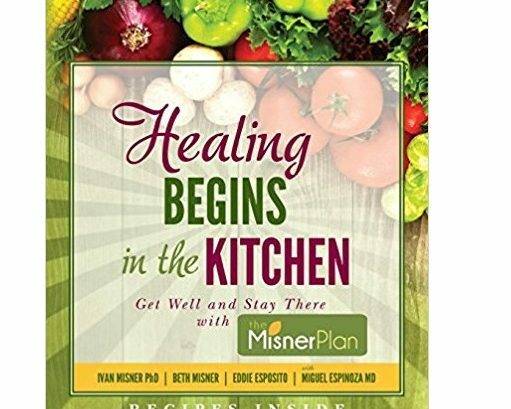 Healing Begins in the Kitchen shares the remarkable story of how I went into remission from cancer just nine months after my diagnosis. 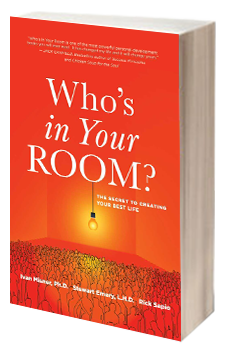 The book offers both information and support for you as you seek to transform your life and improve your productivity, not to mention increase your outlook for a long and healthy life. In the process of doing changing how you eat, many ailments, conditions, and even diseases may simply disappear. 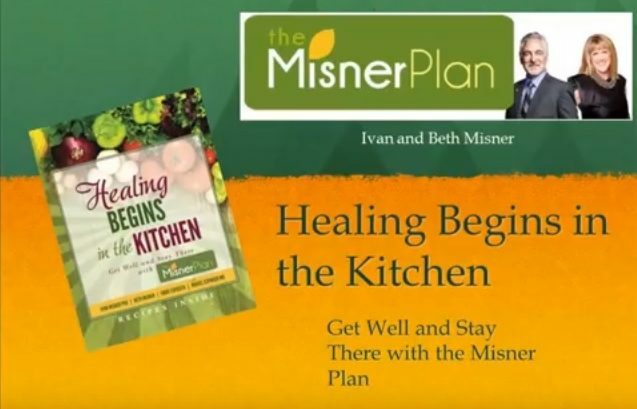 On the Misner Plan website, you will find articles and blog posts with our personal experiences, struggles and successes, as well as contributions from other well-informed and renowned health-care professionals. You will find recipes using the specific food list we used during his recovery. As you read through the content, please share anything you feel would be of benefit to your own social media followers and join in the conversation on the blog page. We invite you to pour a cup of green tea, get comfy and spend some time browsing our site and becoming familiar with the contents of our website. Finally, it’s here – a Misner Plan coaching program. Listen to this recording for a free lesson on the Misner Plan and a chance to hear about our 2018 coaching program. Your success means so much to us, and we are very thrilled you have found the Misner Plan! Let me start by talking about “good stress” vs. “bad stress.” Certain kinds of workplace stress can actually be good for you. Good stress can help give you focus and achieve your personal and professional goals. A deadline is a good example of how it can help you focus your efforts and achieve the results you want. Good stress tends to be short-term. It isn’t pervasive. 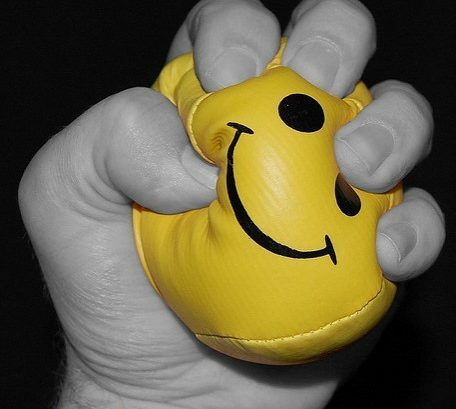 Bad stress, on the other hand, tends to be long-term and inescapable. 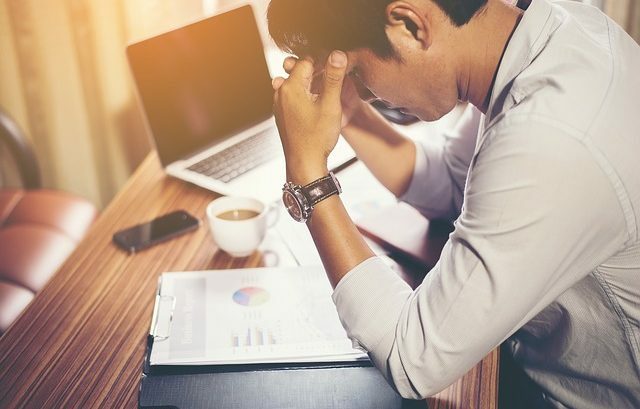 It can feel overwhelming and never-ending What I’ve learned over the last few years is that this type of stress can absolutely, positively, unequivocally, affect both your business and your health. Work in Your Flame. This one may take time. People are either working in their wax (they hate what they’re doing) or they’re working in their flame (they love what they’re doing). Do your best to transition out of things that are your wax and move into your flame. For the record, it took me years to get to that place. Set realistic expectations and move towards that goal daily. Job Discernment. Change the things you can change at work and accept the things you can’t change. A mantra I learned from Jack Canfield which I absolutely love is, I have a child (business), I’m not my child (or whatever applies to you – such as I have a boss, I’m not my boss). Discern what you can change at work and work on it. Those things that are out of your control (like the traffic or your boss), you need to let go. Help Others. According to the American Journal of Public Health, “helping others predicted reduced mortality… by buffering the association between stress and mortality.” Who would have thought? If you help someone to grow their business, you will feel less stressed! Well, to be honest, I’ve seen this professionally for many, many years. One of the principle core values of my company, BNI, is Givers Gain. This is a perfect example of feeling better at work by helping others first. 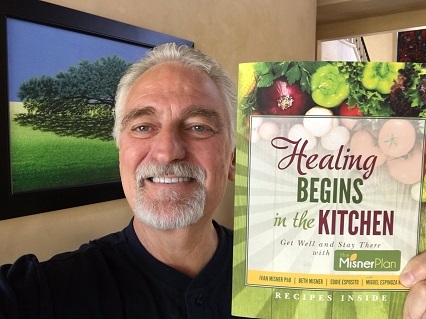 My book, “Healing Begins in the Kitchen” shares the remarkable story of how I went into remission from cancer just nine months after my diagnosis. 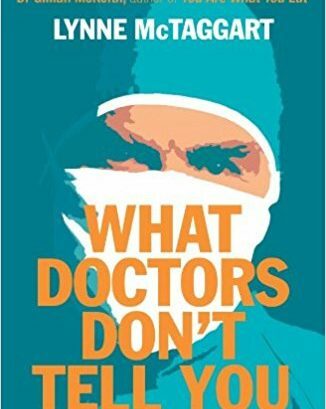 Lynne McTaggart, author of “What Doctors Don’t Tell You”, joins me in this video to discuss her alternative medicine magazine. Chick here to watch this video. 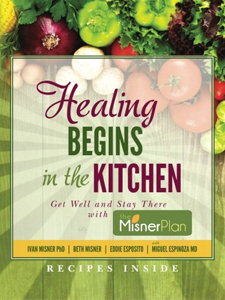 My book, “Healing Begins in the Kitchen” shares how I went into remission from cancer nine months after my diagnosis. It is good to have a plan to address your personal stress and then execute on that plan. Here are a few things that you might want to consider to tackle your personal stress. It’s unlikely that every one of these suggestions will resonate with you – but try most of them on for size. 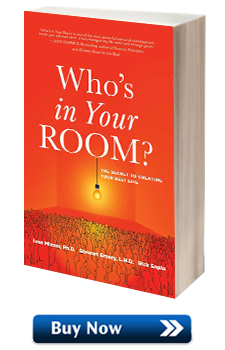 See how they help you and your particular life situation. If you’re feeling stressed out, look over this list and try some of these techniques. They’ll make a difference in your health. Meditate. This is a tried and true standard to manage your personal stress. I’m not always great at doing “traditional” meditation regularly but I do practice it. There are other ways to meditate. I generally take 15-20 minutes every day in a steam shower. I definitely use this time to meditate almost every day. Breathing. This obviously goes hand-in-hand with meditation. However, it is also useful when you find yourself in a stressful situation. When we are in a “fight or flight” scenario our brain goes into overdrive and we tend to do short, shallow breathing. To deal with personal stress, we should take long, deep breaths. Exercise. Walking, running, weight lifting, Yoga, Cycling, martial arts – whatever you’ll do regularly is what you should be out there doing. This is a big personal stress reliever for many people. For me – not so much. I do it for my health, not because it relieves stress. That said, it’s obviously good for various reasons. Mental Health Day. This one is my favorite personal stress management tool. It’s also something that I have done pretty consistently for many years. One day a week, I try to take a “mental health day.” That is, I fully and completely relax. How I relax may be different than how you relax. For me, it’s about staying home and doing what recharges my batteries. It might be watching movies or shows on my DVR or hanging out in the pool. But the bottom line is that I relax and I definitely do not leave the house. It took a few years for my family to understand my need to do this one but, seeing how I was much nicer when I could get one of these each week – made it easier. John Gray (the author of Men are From Mars, Women are from Venus) shares an amazing personal endorsement of my latest book. Don’t take the easy road of eating “junk food” while on the road. Our nutritional choices create our medical conditions. 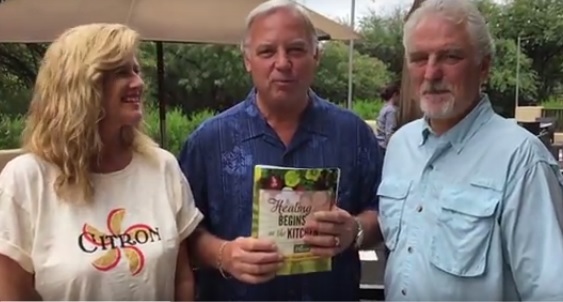 John was able to reverse the symptoms of early Parkensins disease by eating better. Be the captain of your ship and make the best nutritional choices. John’s story is actually in this book. Every week someone I know asks me about my cancer diagnosis. Women ask me for help with a man in their life and men ask me because they’ve been diagnosed with it. Because of this, I’ve written down a lot of what I’ve learned from my experience in this blog post. It is longer than a blog post should be and I apologize for this. However, I’d like to put all of this in one place so I can send people to this for help. Since my own prostate cancer diagnosis, I have had the chance to speak to several men just after they have heard the words from their urologist that I heard in March 2012. I hope my experience and the many things I learned along the way can be helpful to you, whether you or someone you love may be starting out on this journey. Please understand that I’m writing this from a patient’s perspective. I am not a medical doctor. I am not giving you advice or addressing your particular situation. You MUST consult with your doctor before making any decisions about what is best for you! Right after I received my diagnosis, I spoke to five men and came away from these conversations knowing five ways I did NOT want to approach my situation. The conversations I had with all of them was invaluable. It also put the fear of God in me because of the serious side effect from not only the various treatments, but also from the diagnostic tests (biopsies) themselves. It gave me the motivation I needed to put into effect the total and complete dietary and lifestyle changes I made. Not long after my diagnosis was made, I attended the Prostate Cancer Research Institute’s annual conference in LA. I learned so much there from doctors who are at the cutting edge (no pun intended) of the emerging trends in prostate cancer diagnosis and treatment. Your PSA doubling time is important when assessing the possibility that you may have prostate cancer. Many times the PSA (a blood test which measures Prostate Specific Androgen) can begin to rise one or two points over a period of time due to age or other factors, which is of concern, but even more important is your PSA doubling time. If your PSA has doubled within the span of one year, you have reason for concern about prostate cancer. If it’s just creeping up a little year by year, there may be other reasons for that, such as a prostate infection or an enlarged prostate, called benign protastatic hypoplasia. I found it helpful to keep a graph chart of my PSA tests, so that I could really keep an eye on the amount of time it was taking for the count to rise. In my case, my PSA had not even doubled in any one year when my doctor said he wanted to take a look at why my number was going up. He went through the order of diagnostic tests outlined in the next point. And when I made the dietary changes after my diagnosis, the slowly rising number stopped and actually began to drop a clinically significant amount. There is an order to the types of diagnostic tests you can do from less invasive to more invasive. For example, going from an elevated PSA to a biopsy is probably going a bit too far, too fast, unless your PSA is REALLY high. There are many things which can cause a PSA test to come back elevated: bicycle riding, having used the hot tub prior to having your blood drawn, intimacy prior to the test, or, as already mentioned, a prostate infection. I am surprised that most of the men I have talked to have not been made aware of these factors which could be elevating their PSA results. Remember, this is your experience. 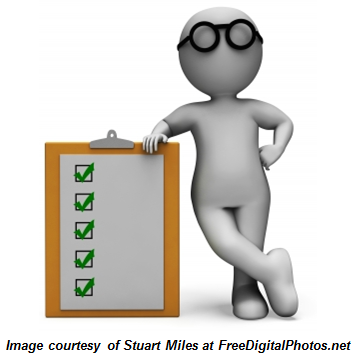 You have the right to request the types of diagnostic tests you wish to have performed. If you feel your doctor is rushing from a slightly elevated PSA to a biopsy, get a second opinion! One of the first things my general practitioner did after my annual PSA came back slightly higher than the prior year’s test was to run the test again. When that one was also elevated, he recommended a course of antibiotics to rule out a prostate infection or prostatitis. When my PSA remained elevated, he then began to move into the cancer-diagnostic procedures. He did a digital exam and then referred me to my urologist, for an ultrasound. A high-definition, color Doppler ultrasound is the next diagnostic step to take if the digital exam reveals an abnormality in the prostate gland. The ultrasound my urologist did was not a high-definition, color Doppler ultrasound, which would have revealed the amount blood flow (angiogenesis) in and around the tumor. This ultrasound did, however, reveal the lesion. The high-def, color Doppler ultrasound is especially important when you are doing active surveillance (point six below). The color Doppler imaging can tell you and your doctor when the tumor is preparing to grow. Angiogenesis, or blood flow, will increase to the lesion as the cells begin to move into a more active phase. The ultrasound performed by the urologist simply revealed the presence of a mass, which could then be measured and the prostate volume could also be determined, but it gave us no information about how active the cancer growth itself was. If I’d had a high-def, color Doppler ultrasound, we would have had more information from the scan. Regarding your scans and other tests, request copies of everything. Most of your doctors will be glad to make copies of the reports and even the imaging scans*. I started a notebook in which I put my PSA graph chart, all my PSA blood test results, the ultrasound imaging reports and the biopsy results report. Having this notebook gave me valuable information to keep a handle on where I was in the process and it also was extremely helpful to the members of my medical team. Overall, it kept me in the position of captain of the game. *One note about the imaging scans, the DVD you will get will probably have an embedded program you will need to install on your computer before you can open the images. Most doctors already have this program on their computers, whereas I did not. It took a few tries to view my images before I realized I needed to install the program! Ask the radiologist about this before taking your DVD. After something shows up on the ultrasound scan, the next step I would recommend is the PCA3 test. This is a test for malignant genetic material from the prostate gland. The doctor will perform a fairly aggressive digital exam called a prostate massage. It is unlike any other massage you will have ever had, I promise, but it is much less invasive and far less painful than a biopsy. Immediately after the massage, a urine sample is collected and the released malignant genetic material is measured. This tells you and the doctor how much cancer is in your prostate and what type of cancerous cells you have. Certain types are fast-growing and aggressive where other types (the type I had) are not. A score of 25 or lower for man my age is considered to be within the normal range. After I was told I was in remission, that verdict was confirmed by a PCA3 score of 26. My next score, about 9 months later, was 17. Very normal. After a lesion has been detected on an ultrasound, many urologists will order a biopsy. I would recommend that you request a PCA3 test first. If your score is normal, you probably will be spared this step. There are side effects to even the biopsy that are not really explained well to us. And I’m pretty sure I have seen some of the instruments used for the biopsy I had in a Puerto Rican dungeon I once toured! I did not know then what I know now and was not equipped to ask the questions I would ask now or to make a different decision than I made at the time. I’m not sure I would have ever had a biopsy if the PCA3 test had been available and confirmed a cancer diagnosis. Since there are bundles of nerve fibers encasing the prostate gland, the biopsy needle can nick them and cause temporary to permanent side effects such as incontinence and impotence. These nerves can regenerate if they are not completely severed, but it is a very delicate procedure. Please be sure you go to someone who has done hundreds and hundreds of these procedures. You don’t want to be part of a learning curve for the new guy! If your biopsy returns positive for cancer, find out how many core samples were taken and how many of them were positive for cancer. This information will help you determine your risk level. The PCRI has a great website into which you can plug all these factors to learn your “color” on the risk spectrum. It is good information to have. Another piece of information to come away from your diagnosis with is your Gleason’s Score. This score will be made up of two numbers. Adding the two numbers together gives you your score, but the order the numbers are added gives you information, too. If the lower number is given first, then the higher number (for example, 3+4), your risk is somewhat lower. If the higher number is first, then the lower (5+2), your risk is higher, even though both scores are a 7 on the Gleason Scale. Remember the part where I told you I am not a doctor? I don’t completely understand this scale, but I know what to look for relating to lower risk! When I am talking about risk, I mean the chance that prostate cancer will be how your life will end. Most men, I learned, begin to develop malignant lesions as they age. It seems to be the nature of the prostate gland. Men in their 50’s have a 50% chance of having prostate cancer, men in their 60’s – 60%, men in their 70’s – 70% and so on. A man in his 70’s, diagnosed with low to medium risk prostate cancer will probably meet his death from some other corner, not from prostate cancer. Knowing my risk factor helped me decide how I wanted to approach my treatment. My numbers all placed me in the low to medium risk category. Having all the diagnostic information I had helped me determine what I was going to do. It wasn’t a case of the doc diagnosing cancer and scheduling me for surgery a few months later! As a side note regarding prostate biopsies, I am concerned about the risks of introducing bacteria into the prostate gland through the rectal wall and also the dangers of piercing the capsule of the prostate gland and of the tumor, and thereby possibly releasing malignant cells into the bloodstream. Traveling prostate cancer cells tend to metasticize to hip and pelvic bones. I have read a bit about the dangers of doing so, and feel that I would have like to have had that information before having done my own biopsy so that I could have made a more informed decision. Urologists and oncologists used to refer to a time of “watchful waiting” related to prostate cancer. Watchful waiting is now being referred to by many doctors and patients as “active surveillance.” You are active in getting your tests, the PCA3 test, the color Doppler scans, and you are keeping an eye on the situation so you know when it is the right time to intervene medically with either surgery, chemotherapy, focal therapy or radiation. Active surveillance gave me the time and the space to make the kinds of changes I made to see if it would give my body what it needed to repair the damaged cells. I had monthly PSA tests, monthly high-def, color Doppler ultrasounds and saw my urologist every six to nine months to evaluate all my numbers. Even now that I am in remission, I will continue active surveillance with much more time in between the tests. I like the Center for Advanced Medicine’s position that we are watching the hour hand now, not the minute hand! Along the way I learned some important facts about the standard prostate cancer treatment protocols. I had thought originally that brachiotherapy, or the implanting of tiny radioactive seeds within the tumor, might be an effective way to go. What I did not know is that once radiation is done, there are no other medical treatments that can be done. Radiation is the last resort. A doctor will not do surgery on a radioactive prostate. It is not safe to do so. I learned that high-frequency ultrasound waves (or HIFU) is working well for some patients, and so is cryotherapy, where tiny beads of ice crystals are implanted into the prostate, freezing the cancer cells. With all these treatments, there is still a fairly high risk to the nerve bundles which can result in serious and lasting side effects. I learned that a radical prostatectomy was NOT my option if at all possible! The side effects are assured and generally permanent. If I had a fast-growing malignancy, I might have had a different response. I recommend a couple of books to read if you have received a prostate cancer diagnosis. The first is Invasion of the Prostate Snatchers, written by Dr. Mark Scholz. Dr. Scholz is the founder of the PCRI. 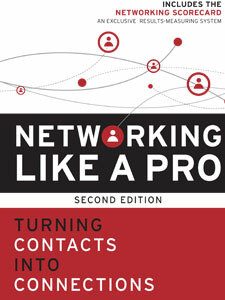 He has co-authored this book with one of his patients. I found it extremely informative and comforting. Dr. Scholz is an oncologist, not a urologist, so surgery is not his first reaction to a prostate cancer diagnosis, as it is for most urologists. He is also very well-versed on the many various approaches to healing from prostate cancer. The second is Love, Medicine and Miracles by Dr. Bernie Siegel. 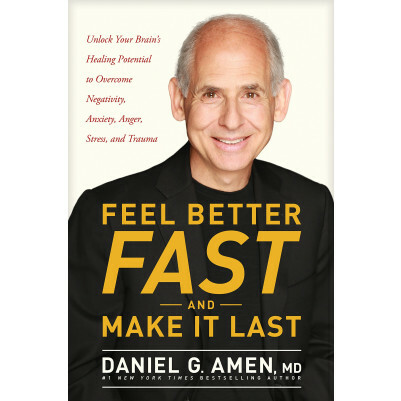 This book reveals the incredible power the mind has over the medical conditions of our bodies. Since hearing those words in March 2012 – You have cancer – I have come to understand more deeply just how integrated our mind and bodies are when it comes to healing from conditions like cancer. Something which was recommended to me after the positive diagnosis was a full-body CT scan to detect whether or not any cancer had developed along any of my bones. At the point I was in the diagnostic process and given my low to medium risk factor, I feel that this may have been completely unnecessary and would have gotten a second opinion before ingesting the radioactive biomarker to see where it might have uptake into my bones! Looking back, it does not seem very wise to have gone that route to me, personally. Remember that you are the Captain of your experience. Knowledge gives you the opportunity to make choices. Get as much information from sources you trust and then do what YOU feel is best for you. It is your diagnosis. It needs to be your choices – not someone else’s.